Day #3 of Taylored Expressions Sneak Peek! Welcome back! This is my second post for today. Here is my Simon Says Stamp Challenge Post. Today is day #3 of Taylored Expressions new release sneak peek. Hope you have enjoyed my Day #1 and Day#2 projects. I have more to share with you today. Again I am showcasing two new products. 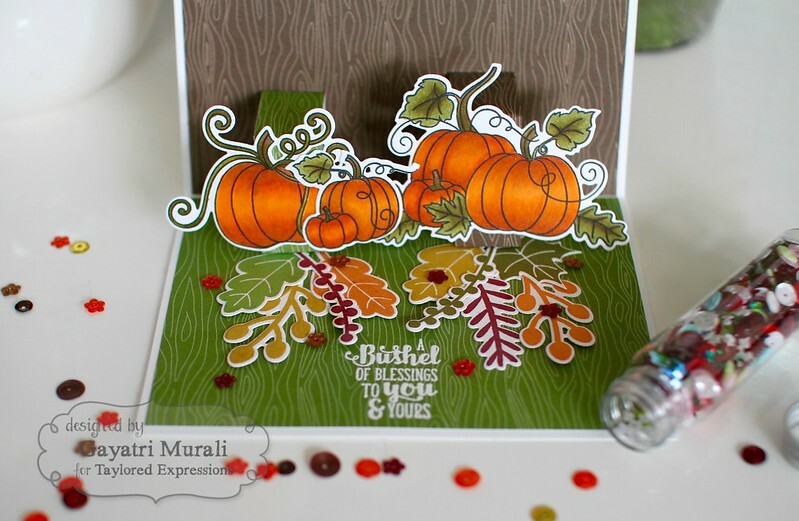 Two new stamp sets, first set fall themed called Bushel of Blessings and coordinating dies. The second birthday themed called Simply Stamped Cupcakes and coordinating dies. 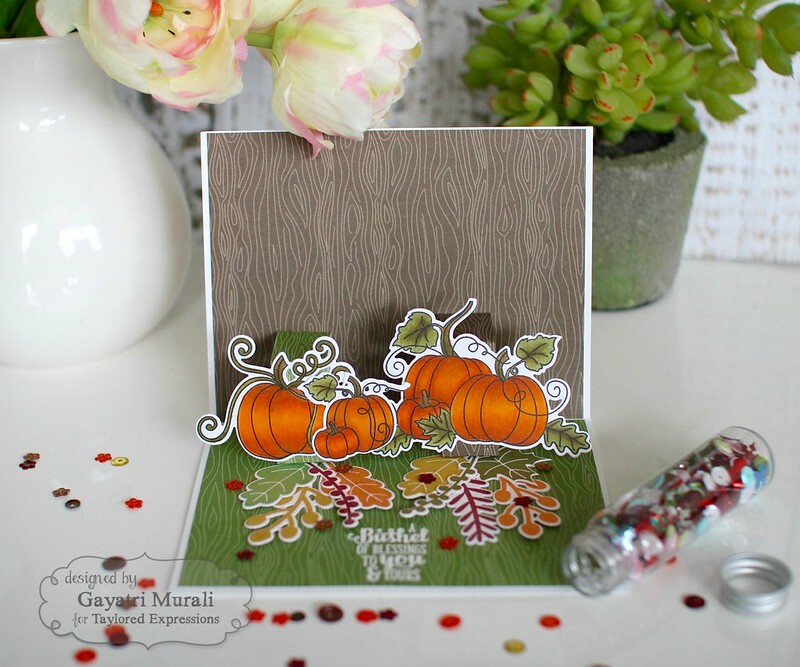 Let me start with the fall themed stamp set Bushel of Blessings! I have stamped and copic coloured the images from the Bushel of Blessings stamp set and die cut them using the coordinating dies. I dressed the inside of the card with paper from Harvest 6×6 pattern paper pack and added two pop up folds using the pattern paper leftovers. I adhered the stamped die cut images from Bushel of Blessings stamp set on to the pop up folds. 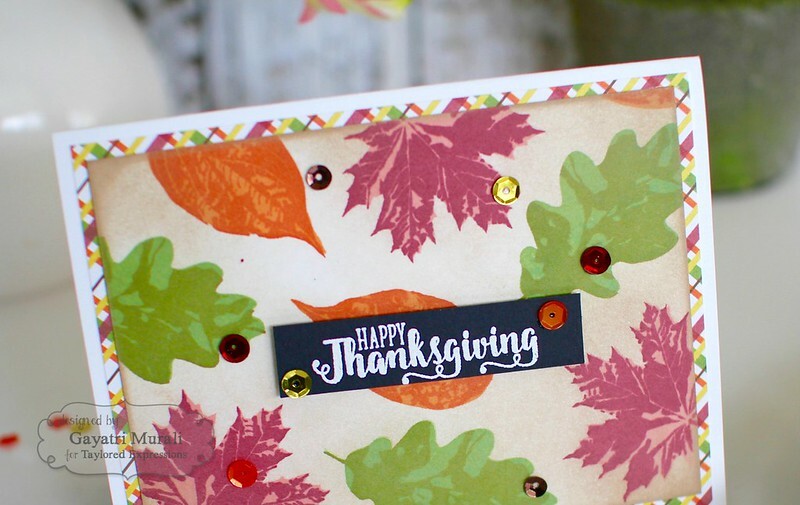 I also added stamped images from the new Fall Florals stamp set using Pumpkin, Dijon, Mulled Wine, Basil TE dye inks and die cut them using the coordinating dies. Then I white heat embossed the sentiment from Bushel of Blessings. Then I used the flower sequins from Harvest sequins to embellish it. For the card front, I used the plaid pattern paper from Harvest 6×6 pattern paper pack on the base. 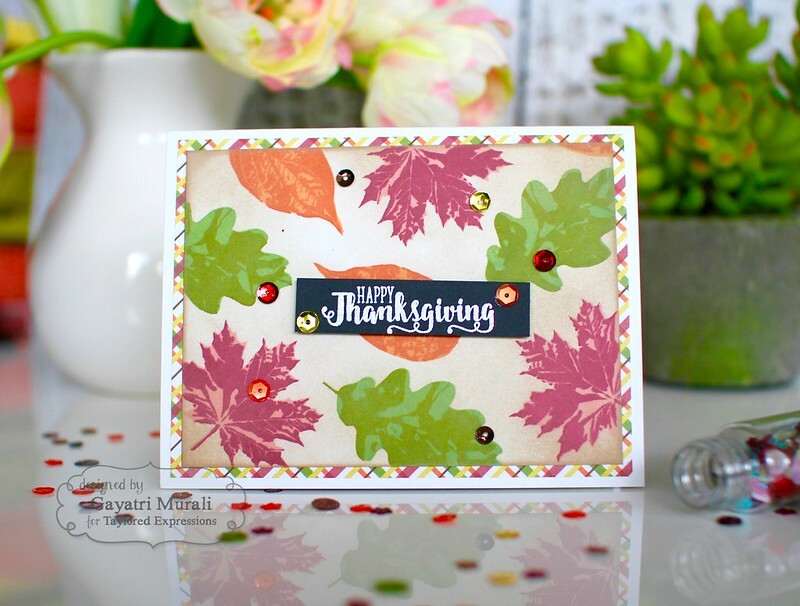 The top layer is stamped with images from the new Simply Stamped Leaves stamp set using TE dye inks and sponged with Toffee dye ink. The sentiment is from Bushel of Blessing stamp set white heat embossed on Oreo cardstock. Embellished with sequins from Harvest collection. I kept the front of the card simple. 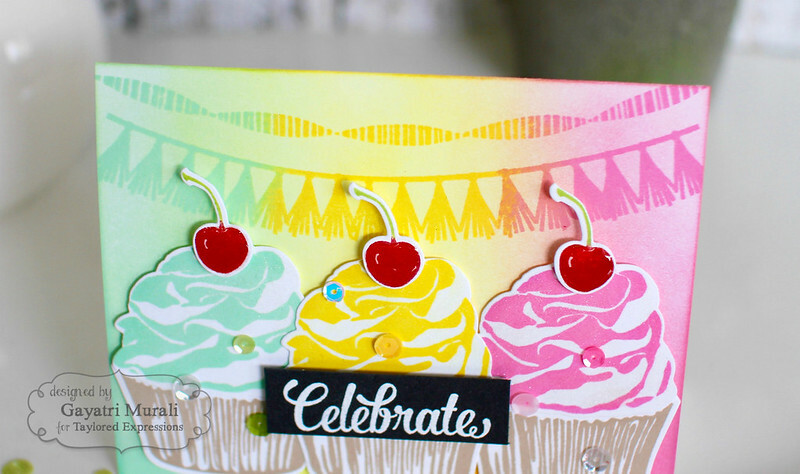 The second product I am showcasing is Simply Stamped: Cupcakes and coordinating dies. I love layered stamp sets. Taylored Expressions have a series of Simply Stamped, all of them have layered stamp images. So gorgeous. This cupcake set is my favourite so far. I went to town with it stamping and made a bright colourful card. I have used only the second layer of the frosting and wrapper to make my cupcakes. I have used Toffee dye ink for the wrappers and Mint Julep, Lemon Meringue and Strawberry Milkshake dye inks for the frostings. I stamped the cherry in Cherry Pop and Granny Smith dye inks. I die cut them all out using the coordinating dies. For the card front, I sponged the same dye inks I used for the frostings in ombre fashion. Then I used the streamers stamps from the new Party Streamers Stamp Set and inked up using the same colours of frosting and stamped using MISTI. I adhered the cupcakes using foam adhesives to give dimension. Cherries on top with glue. The sentiment is white heat embossed on Oreo cardstock, trimmed and adhered using foam adhesives as well. Finally embellished with sequins from Hello Happiness collection and added glossy accent to the cherries. All the products I used to make this card are listed below. Hope you have written everything you want on the wish list because tomorrow is the release day. All the new products are available for purchase tomorrow Thursday at 7:00 AM PDT. I will be back tomorrow with another project for the release day. Until then have a lovely day or evening where ever you are in the world! I like the pop up inside of you first card a lot. Both cards give great examples on how to use these versatile sets. Love all your cards, but the way you colored those pumpkins – WOW! Two beauties. Thanks for inspiring and I would say I love the Thanksgiving card to most. Only because Fall is my favorite season. Who doesn't love cupcakes??? Great cards. I love both cards. 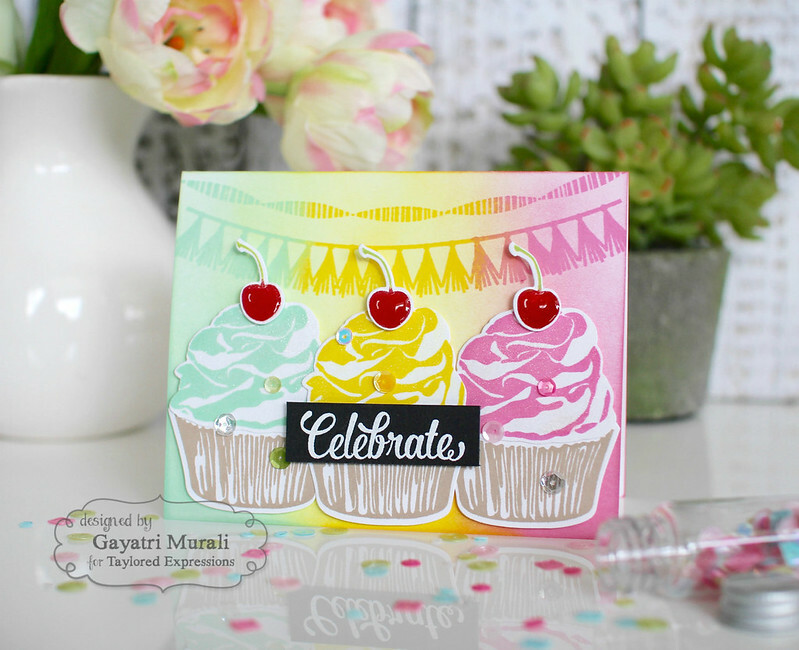 The cupcake card with the matching colors is so original and pop up card – is by far my favorite card as it is outside the box! Great job. Beautiful cards… Looks like my shopping list just grew again!